This extensive, edited volume showcases established and emerging scholars in the field of Teaching Assistant (TA) and International Teaching Assistant (ITA) education. 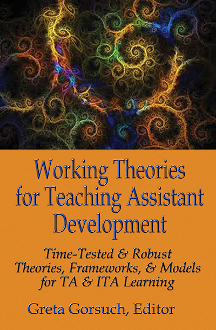 Working Theories goes beyond reporting good practices or program descriptions, which typically comprises many books on TA and ITA development. Instead, Working Theories places time-tested, robust theories, frameworks, and models of TA and ITA learning and development at the center of graduate student education by providing a scholarly venue for description, explication, and application of these theories. In turn, these theories and models from psychology, sociology, pedagogy, discourse analysis, and second language learning will be presented in such as way as to inform good practice, but above all, motivate future research. About the Editor: Greta Gorsuch is an Associate Professor of Applied Linguistics & Second Language Studies at Texas Tech University, and has researched educational programs and ITA education for ten years. Her publications have appeared in English for Specific Purposes, Journal of Faculty Development, The Journal of Graduate Teaching Assistant Development, and Education Policy Analysis Archives, among others. She edited The Language Teacher (The Japan Association of Language Teaching) and has guest edited special issues of System and TESL-EJ.